DESCRIPTION: Built in 1914, this stately 12 bedroom summer home is situated above the sea with over 12 acres of woodlands behind it. The house offers magnificent views overlooking Frenchman's Bay and on the inland side of the house there are mountain views. 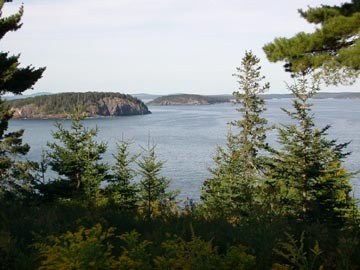 Easily located approximately 1 mile from down town Bar Harbor for activities such as hiking, biking, kayaking, golf, shopping and dining. There is also a sheltered picnic area with picnic table for those not so pleasant days. LAYOUT: FIRST LEVEL: Brick entry foyer w/ fireplace, brick terrace w/ ocean views. 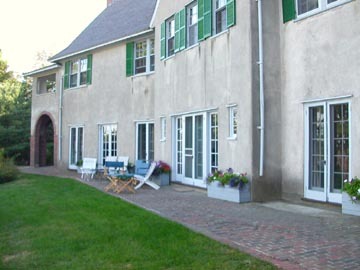 Formal living room w/ fireplace and French doors to the terrace and outer grounds, dining room w/ a fireplace and seating for 22, French doors leading to an outside dining area and terrace, library w/ fireplace, Butlers pantry, kitchen with dining area for 9, sitting/playroom, laundry room, 1/2 bath, small fax room. SECOND LEVEL: Master bedroom suite with king bed, fireplace, walk in closet/changing room and private full bath. A porch with beautiful water views adjoins the master suite. Bedroom with queen bed that shares full bath with double bedroom. Bedroom with double bed, fireplace, shares full bath with claw foot tub w/ bedroom with two twin beds. Bedroom with queen bed and private full bath, also with doorway to servants wing hallway. Second master bedroom suite with king bed, adjacent full bath and step down to nursery with 2 cribs in a separate room. Many if not most of the rooms on this floor have water views and doors leading to adjacent rooms, which may be kept open or closed, depending upon your needs. Four more bedrooms with single beds and shared bath with tub in former servants wing. Two roll away beds to be placed where desired. OTHER: Detached game house for badminton, wall tennis, basketball. SPECIAL CONDITIONS: Check in 4pm - Check out 9am. $500 of cleaning bill covered by owner, any balance will be deducted from the security deposit. Maximum number of people is 24, if both cribs and both roll away beds are used.